Tulpa is a Sanskrit word meaning “to build” or “to construct” also translated as “magical emanation”, “conjured thing” and “phantom”. It is a concept in mysticism of a being or object which is created through sheer spiritual or mental discipline alone. It is defined in Indian Buddhist texts as any unreal, illusory or mind created apparition. According to Alexandra David-Néel, a Belgian-French explorer, spiritualist and Buddhist, who observed these practices in 20th century Tibet, tulpas are “magic formations generated by a powerful concentration of thought.” It is a materialized thought that has taken physical form and is usually regarded as synonymous to a thoughtform. The practice is perceived as a deeply spiritual and highly disciplined process, that requires (in Buddhism) that the creator be of pure heart, spirit and thought, and that the transient creation of the Tulpa is for the service of the human soul. The practice of manifesting thought form ‘hallucinations’ into reality seems to have leapt from the deeply spiritual to the mundane and perverse in the creation of imaginary friends and sexual partners. An observation by Neel and by Tibetasn mystics is that given enough vitality, these thoughtforms can not only develop a mind of their own, but assume a role as a real being. If we consider the effect of ‘Tulpa’ manifestation and infection in a world addicted to instant gratification specifically through social networks and mass media, we might observe or become aware of the potential for the same power of thought, no longer from one ‘elevated spiritual being, but the persistent voyeuristic weaving of thoughts given power by quantity not quality. The case of the tragic events of the girls in Wisconsin with its referencing ‘Slender Man’, is one of many suppositions of such modernistic thoughtform manifestation. Tulpa theory suggests that mass and persistent thought form can manifest as a tangible form in mundane reality to re-enact the negative thoughts. These Tulpas are generally directed and ‘latch onto’ the vulnerable. The Slender Man is not a demon of history, rather its manifestation is relative to the increasing use of social networks and mass media. Further theory on the appearance of ‘demonic’ beings links to the concept of Quantum physics, in which sub atomic particles are through the same persistent thought or thought form energies, brought into ab atomic physicality for the moment of the intention of the thought and then dissipate to sub atomic reality again. 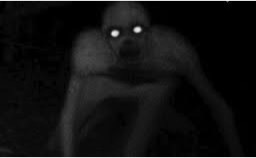 Where as Tulpa are manifestation of shadow thoughts and at that level are not essentially real, sub atomic manifestations are ‘real’ and are more akin to the lurking lost soul demon. Shamanically the concept of the Core Theory is a combination of both previous notions with the additional factor of the valiant person. A Valeant person is one who has a valency, a pre-morbidity or valency to receive an intrusive energy. These valencies are most often negative or emotional need or regret. We might consider the person with great soul loss that will accept ‘demonic soul’ energy to fill the space. This person will become the vessel of the thought form and/or the ab atomic presence and will present as a traditional demonically possessed individual. Given the world’s and especially the Western world’s addiction to Facebook and other cyber social networks, where every thought is given the power of thousands of observers without requiring validation of truth, one might think will be a losing battle. It is no surprise that humans are drawn to the pain and suffering of others as voyeurs as if waiting for something bad to happen. Watching some contact sports and hearing the crowds cry out for violence is one such example. Sadly humans seem to have a propensity for negativity. Cyber bullying resulting in the sufferings and often the deaths of others can be viewed as manifestation of thoughtform demons. Gossip, stalking, meddling, all might be considered initially as the nourishment of Tulpa Demons, whichever theory is evoked, and yet observation and hindsight reveal that once a thought becomes a word, that word is let loose into the miasma of human shadow and that shadow gives power to the word until it gains a sense of assuming reality. This shadow is fed by the three great fears of humankind; fear of the unknown, fear of abandonment and fear of being different. The three fears create a crucible of judgement into which the shadows of the collective give fabric to the demon. The response is to use the same mechanisms in reverse – this is the essence of prayer. Not the prayer of petition – this furthers the attention to the negativity and ego desire. Rather the prayer of intimacy, stillness, silence. To be that moment of emptiness within the storm of these thought forms does not just negate them, it creates a quantum reality in which they did not exist. Not to be seduced or manipulated or drawn into the attention of the Tulpa (whatever caused it) defies the need of the thought form; without that need they cease to exist. To be in intimate union with the ancestral spirits and that song of union is the most powerful tool against these forms of possession; a sort of sacred ignoring. Prayer is an act of discipline; not an act of loving, rather to be love without need. These thought forms are as Gestalts, requiring completion or input. The theory is that once a Gestalt ‘rises’ it must and cannot be stopped until completion is reached. With the Prayer concept the focus is to eradicate the genesis of the thought form or ‘pool’ from which it emerges. It seems like the call is for doing nothing! The truth is in the spiritual practice of the unified ritual in which the ritual, as a manifestation of prayer; an act of heart not will, is the act of intentionally creating nothing. This ritual prayer call us to be that still moment before movement, the silence before the voice, the dark before dawn. To be that moment of hope that by its essence creates an impetuous for action. Maybe no random internet surfing, perhaps intentionally creating that nothing moment each day, maybe taking that anchor of emptiness to a busy place, perhaps not getting seduced into the communal voyeurism of social networks or mass media, is the rubrics of our personal rituals. The true virtuous ritual is to be in that place of true magic Tei Sarna; the moment if everything and everything in the moment. Devoid of history and resistant to future, the moment is the truth of intimacy with self, the spirits and by default with each other. In this way each becomes a ritual in themselves and together these countless rituals weave the one great ceremony of being. No demon can attach itself to that.